As we previously reported, last night (November 27, 2014) Richard Rogers were honored RDI for his pioneering and influential approach to urban design and improving the quality of public spaces to create thriving and resilient cities. Although it is not directly linked to fashion, we want to tell you more about the work of Mr. Rogers, because it is inspiring and has a social meaning. Richard Rogers first came to prominence in the late 1960s with the competition-winning scheme for the Pompidou centre in Paris, and he has been at the cutting edge of architecture and urban design for 50 years since. He has twice won the Stirling prize, first for the Madrid international airport and more recently with the Maggie's Centre in London. Perhaps his greatest legacy though is his contribution to urbanism, through the work of the Urban Task Force and the publications resulting from it, which arguably have had more influence on the development of sustainable and liveable cities than any other design initiative in the last 30 years. 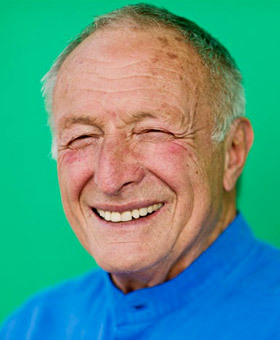 Richard Rogers is best known around the world for his influential high profile design work and innovative approach to urbanism. His practice has always had a fascination with improving the design industry, for instance in the award winning Oxley Park scheme, which brought modern prefabrication techniques to a very traditional area of the construction industry. His pioneering work in low energy design gave us exemplars such as the naturally ventilated Welsh Assembly rooms and the Bordeaux law courts. His delight in structurally specific long span curvilinear structures gave us the airports at Madrid and Heathrow's Terminal 5. Rogers's highly successful architectural practice is also a model for an alternative enterprise. The practice set itself up with a strong and public belief in profit-sharing with employees and is in fact owned by a charity which distributes excess profits to selected good causes. For many years Richard Rogers was the chair and spokesperson for the Urban Task Force set up to raise the standard of urban design in London and the UK. Its influence was global, and the publications resulting from it remain some of the most significant guidelines for creating liveable and workable cities, which have helped improve public spaces and lead to a much greater emphasis on the quality of the public realm over the last decade. Richard Rogers had more influence through his position as adviser to the mayor of London in the Livingstone era than any other member of his profession. Rogers's work has been celebrated in exhibitions throughout his career. Two of the most recent include the personal retrospective at the Royal Academy last year and the current RIBA/V&A exhibition at the RIBA to coincide with the TV series on 'The Brits who built the Modern World'. The publications of his theoretical work include: Cities for a Small Planet (the publication of his Reith Lectures in 1997), Towards and Urban Renaissance (the final report of the UK governments Urban Task Force 1999), Cities for a Small Country (2000). Richard Rogers's belief in the positive impact that architecture and urban design can bring to society is deep rooted and infectious. No single member of the profession more clearly exemplifies the belief that artists and designers have a duty to society to improve the Built Environment. He continues in his eightieth decade to provide an inspiration to young designers and architects.